Sgt. Nick rolled up to the Guam airport in a borrowed minivan and packed up our family of six, along with our dozen pieces of luggage, without batting an eye. After an exhausting 20-hour flight which featured one child with a cast on his arm and another getting airsick repeatedly, all of us a little heartsick at leaving behind friends and family we knew we wouldn’t see for a couple of years, it’s no stretch to say we were not at our best in that moment. But Sergeant Nick was, and it meant everything to our family. Each branch of the military has an Overseas Sponsorship program, wherein a "sponsor" is assigned to the miltary member or may be requested, depending on your branch of service. 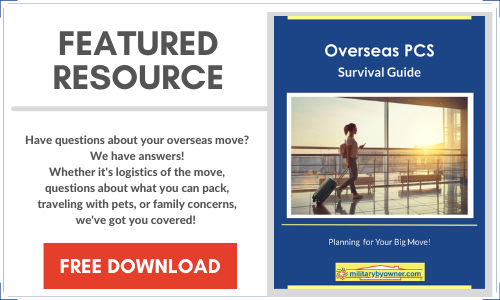 Provided with training by the military, the sponsor's role is to serve as a point of contact and help ease some of the transition and culture shock of moving overseas. Unbeknownst to us at the time, Sgt. Nick was a single, childless NCO with a big heart. After getting us settled in our hotel and leaving us to enjoy some sleep, he showed up bright and early the next morning in the borrowed van and shuttled us all around the island, pointing out important sights. Between what he referred to as his “quick smoke breaks” (which I feel were well deserved! ), he regaled us with stories about the area, experiences he’d had so far, and how he rode his bicycle from his apartment downtown to his job on the base each day, complete with an ashtray mounted on his bike’s handlebars! While I know he assisted my husband with the myriad tasks of inprocessing and settling in that go along with an overseas PCS, he helped all of us feel excited about the new location, down to our youngest who was all of three years old. While the military does a great job of preparing military members for relocation, we all know that a military move affects the entire family. Add the overseas component, and the stress of the transition is multiplied. The sponsor is usually the first contact military families have when arriving in country, and thus can have a ‘make it or break’ effect on the entire family’s attitude and feeling about the new place. Since then, we’ve had three other overseas assignments and experiences with other sponsors. While none of the rest of them were as colorful a character as Sgt. Nick, each of them aided our arrival through help with the following, regardless of the location. Educate you on some of the local customs and especially the ‘no-no’s’ that you wouldn't know otherwise. You don't want to start off a new assignment by inadvertently offending future neighbors! Let you know information about local must-sees as well as high-crime or other areas to avoid. Teach you some common phrases or questions to ask in the local language. Point you to travel/day trip resources. Provide information about possible housing. Pros/cons of military housing vs. "on the economy," if that's available. Give you information about activities for kids: schools, sports, etc. Advise how to navigate local transportation options. But the most important part of a good overseas sponsor experience is the knowledge that, in the midst of a completely foreign in more ways than you could ever imagine experience, someone cares and is invested in making your early days in a new country as easy as possible. Those who’ve left their home country behind are likely familiar with the raw and confusing feelings of displacement that go along with the excitement of the new experiences. Knowing you're not alone means so much. For our family, it added a layer of security and comfort. Though many years have passed since our first overseas move and Sgt. Nick is long retired, I hope that, if you move overseas, you’ll find your own amazing sponsor and even go on to be “Sergeant Nick” for someone else!